Race winner Kimi Raikkonen celebrates on the podium after winning the United States Formula One Grand Prix at Circuit of The Americas on Oct. 21, 2018, in Austin, Texas. 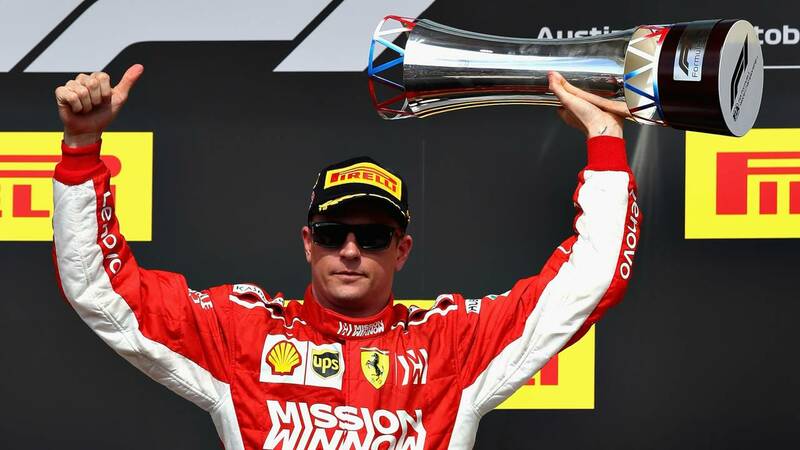 (CNN) - Lewis Hamilton will have to wait a little longer to clinch his fifth F1 world title after Ferrari's Kimi Raikkonen claimed his first victory in 113 starts to take a gripping US Grand Prix in Texas Sunday. Hamilton finished third in his Mercedes behind Raikkonen and Red Bull's Max Verstappen but still increased his title lead to 70 points over Sebastian Vettel, who was back in fourth after an early spin at the Circuit of Americas. Raikkonen overtook polesitter Hamilton off the start and took advantage of perfect race tactics from his Ferrari team to take the checkered flag for the first time since Australia in 2013. "It's been a long wait, but here we are," said the popular 39-year-old Finn. Hamilton caught the two frontrunners after a late second pit stop, but could not find a way to pass them, briefly going off the track in an overtaking tussle with young Dutchman Verstappen. "Congratulations to Kimi and a great job from Max too," said the 33-year-old Briton, "That was the best we could do today and it was great we could do some racing." Ferrari number one Vettel never fully recovered from a spin on the first lap after tangling with Red Bull's Daniel Ricciardo, dropping back to 15th place before a brave recovery, overtaking Hamilton's teammate Valtteri Bottas for fourth on the penultimate lap of 56. A distraught Ricciardo later retired through a power failure, leading to a Virtual Safety Car period in which Mercedes took the opportunity to pit Hamilton as early as the 11th lap for fresh tires. Ferrari kept its two cars out, which later played to their advantage, in particular Raikkonen, who is leaving the famous Prancing Horse team at the end of the season. Vettel, whose title challenge has evaporated in the latter part of the campaign, rued his early off that saw him lose more ground on his arch-rival Hamilton. "I'm happy for Kimi," he told Sky Sports. "But the tough times for me don't seem to be over, it should have been a better day for us." By contrast, Verstappen, denied a podium in Austin last year after a controversial decision by race stewards, was left to celebrate a superb second place after starting from 18th on the grid following a pre-race penalty. "Today he's driven an unbelievable race," said team boss Christian Horner. With a maximum of 75 points available in the final three rounds, Hamilton is set to clinch his fifth title in Mexico weekend, drawing him level with the legendary Juan Manuel Fangio on the all-time list. Germany's Michael Schumacher leads the list with seven and 91 race victories to Hamilton's current tally of 71. Vettel, who was also hoping to claim his fifth world title, will doubtless look to a change of fortunes next season after a disappointing conclusion to the 2018 campaign, littered with errors and typified by his early spin in Austin. Even if the German wins in Mexico, a seventh placed finish for Hamilton will be enough.